On 26 July 2014, feast day of the Synaxis of Archangel Gabriel, Metropolitan Hilarion of Volokolamsk, chairman of the Moscow Patriarchate’s Department for External Church Relations, officiated at the Divine Liturgy at the Moscow Representation of the Patriarchate of Antioch, the Church of St. Gabriel the Archangel. Concelebrating with him were Metropolitan Niphon of Filippopolis, rector of the Representation; hierarchs of the Church of Antioch: Metropolitan Elias of Tyre and Sidon and Bishop Ephrem of Seleucia; Archimandrite Stephan (Dispirakis), representative of the Patriarch of Jerusalem to the Patriarch of Moscow and All Russia; Archimandrite Feoktist (Dimitrov), representative of the Patriarch of Bulgaria to the Patriarch of Moscow and All Russia; Archimandrite Serafim (Shemyatovsky), representative of the Orthodox Church of the Czech Lands and Slovakia to the Patriarch of Moscow and All Russia; Archimandrite Alexander (Pihach), representative of the Orthodox Church in America to the Patriarch of Moscow and All Russia; archpriest Nikolai (Balashov), DECR vice-chairman; Archimandrite Dionisy (Shishigin), dean of the churches of the Bogoyavlensky District in Moscow; protodeacon Vladimir Nazarkin, assistant to the DECR chairman; and clerics of the Church of Archangel Gabriel. Present at the service were Mr. Alexander Torshin, First Deputy Chairman of the Council of Federation of the Federal Assembly of the Russian Federation; Mr. Alexander Saltanov, member of the Imperial Orthodox Palestine Society, Vice-President of Russian Railways public corporation; Mr. Sven-Olov Carlsson, Minister-Counsellor, Deputy Head of the EU Delegation to Russia; ambassadors of Columbia, Chile, Serbia, Netherlands, Pakistan, Côte d’Ivoire; and representatives of the diplomatic corps of France and other countries. During the Liturgy, a prayer for peace in Ukraine was said. After the service, a thanksgiving before the Icon of Archangel Gabriel was celebrated outside the church. 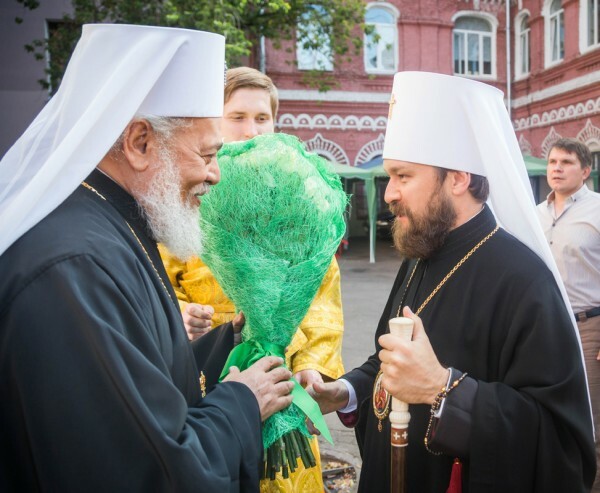 Metropolitan Niphon of Filippopolis, representative of the Patriarch of Antioch and All the East to the Patriarch of Moscow and All Russia, thanked Metropolitan Hilarion of Volokolamsk, as well as representatives of the Local Orthodox Churches to the Moscow Patriarchate, and all the worshippers for the joy of common prayer on the feast day and conveyed to all those present the blessing from His Beatitude Patriarch John of Antioch and All the East. “Today during the Divine Liturgy we lifted up our zealous prayer for the suffering Ukrainian people, asking God to have mercy upon them and stop the internecine war and restore peace in the Ukrainian land. We also fervently prayed for the cessation of persecution against Christians in the land, which is, actually, the cradle of Orthodoxy – in Syria, Iraq, and other Middle Eastern countries, where Christians today are subjected to the most severe inhuman persecution, and where the very existence of Christian churches is under threat. “…the holy Russian Church is doing all she can to help the holy Church of Antioch and all Christians in the Middle East, subjected to persecution. Our Church, in the person of His Holiness Patriarch, hierarchs, clergy, and our pious people, will always help the Church of Antioch, feeling solidarity with her and remembering the words of St. Paul, “and whether one member suffer, all the members suffer with it” (1 Cor 12:26). Whether Christians, our brothers and sisters, suffer in the land of Ukraine or in the Middle East, the whole body of our Christian Church suffers. The heart of every believer is bleeding when he hears about new sufferings and persecutions against the holy Church and the Orthodox faith.